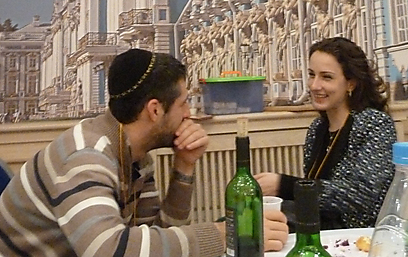 After decades of assimilation, young members of Russian city's Jewish community are connecting to their roots through Jewish student clubs, synagogue activities and annual Limmud festival SAINT PETERSBURG – When Tsar Peter the Great founded Saint Petersburg, the northern pearl of the Great Russia, about 310 years ago, he didn't imagine a reality which would see the city's Jews gathering for a conference based on Judaism studies, out of pride, not to mention waving their Jewish identity. First of all, because Jewish identity and pride were an oxymoron which did not fit the reality of the 18th century, and secondly, because Jews were not even allowed to settle in what was known as the "window to Europe." But years after the tsars of Romanov, the Bolshevik regime and World War II, it seems that the Jews of Saint Petersburg are there to stay. Those who wanted to make aliyah or emigrate westward, fulfilled the right of return and emigration some time ago. Those left behind have relatives in Israel and frequent visits to the Holy Land, which they can afford with their nice salaries and as people considered the elite of the local Russian elite. And yet, something is missing. Those connected (or slowly returning) to their roots are trying to fill the void through Jewish student clubs, activity in the local (Chabad-sponsored) synagogue which celebrated its 120th anniversary about two weeks ago, and mostly semi-institutionalized organizations. But the highlight appears to be an annual event, which draws hundreds of Jews for a weekend of lecturers and activities and has already become a tradition: Limmud FSU (Foreign Soviet Union). The Limmud FSU conferences are held every several months in different places in Eastern Europe, Israel and the United States, and assume a different nature according to the requirements of the hosting community, which organizes the lectures and coordinates the lecturers. What started off as a small, local organization eight years ago is today an enterprise like no other in the landscape of institutionalized Jewish organizations: Thousands of young Jews from Eastern European countries, whose families were disconnected from their roots for decades, seeking to connect to other Jews – as well as to their own Jewishness. It was the vision of one person, Chaim Chesler, which took shape and took on a life of its own. A special Art Limmud FSU Festival concluded in Jerusalem only several weeks ago. It was preceded by the Limmud conference in Saint Petersburg, which had an unusual nature due to the characteristics of the local Jewish population. For example, in a city assumed to be inhabited by some hundreds of thousands of Jews, there are "only" about 60 or 70 active Jews. But in order to understand the nature of the city's Jewish community these days, we must go back in time to the second half of the 19th century, when the Jews began arriving in Saint Petersburg, or Petersburg as the Jews refer to it, and founded a secular community in the city. "In the modern Jewish synagogue the organ was played," says Roi Nathan, the editor of the Jewish Agency website and a walking encyclopedia on the history of the city's Jews. "In the second half of the 19th century, ahead of the revolution, Russia changed significantly. A Russification process began, with mixed marriages and a very large movement of people who converted to Christianity: Intellectuals, artists and musicians. They all aspired to become educated Russians and demonstrate excellence, and although the Jews made up less than 5% of the city's residents, their percentage among the elite was much, much higher." In what may have been the most Jewish-secular city in the continent at the time, developed an educated and elitist community – two traits which its Jews have kept to this very day. Yet the organ is no longer played in the Reform synagogue, and the German rabbi has been replaced by Chabad emissaries. "The local community is characterized by high intelligence," says Rabbi Zvi Pinsky, one of the Chabad emissaries to the city in the past 18 years. "The prototype of the local Jew is very educated, cold, cynical and a rationalist. Nonetheless, we are talking about quite a united community. And there are good ties between the different Jewish organizations. There is hardly a concept of 'Jews' wars' here." 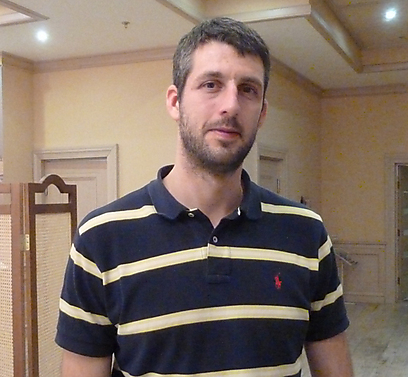 Rabbi Pinsky, who works mainly with Jewish students, arrived at Limmud to contribute the religious-Orthodox aspect. Of all the participants, he is the only rabbi lecturer in a conference based on Judaism. "I believe that every Jew is a Jew, even if he has a chilly coating on the outside," he says, smiling. "There is an active Jewish life here, and the synagogue is full of life. The secular guys are not afraid of us, and they come to us." Rabbi Pinsky observes the process the community has been going through since 1996, admitting that he has no idea how it will end. "The community that remained here is interested in living here of all places; it did not immigrate to the US, Israel or Germany. It's a well-established community." "In St. Petersburg today people are not ashamed to say that they're Jewish, because the Jews are considered successful," says Roi Nathan. "There isn’t any intentional institutionalized anti-Semitism either. Many Jews began showing an interest in Israel in the Communist era. There were Zionist conferences, and material on Judaism and Zionism was passed around in different ways. Today there are many 'illegal' Jews living in the city, without a visa. Jews who arrived from Georgia, the Caucasus and Ukraine for business purposes." Chabadniks in a place like Saint Petersburg must be open and accept every Jew – even one whose Judaism has not been properly clarified. "I am a Chabadnik who believes in every Jew," the rabbi says. "Last summer we had nine weddings in the synagogue, while in previous years we had a total of only three or four weddings a year. It may be laughable from a numerical aspect, but I see it as nine fewer cases of assimilation. "Only last Thursday we conducted five circumcision ceremonies, and we are talking about adults. One of them is getting married in about a month, and is interested in being circumcised when he goes under the chuppah, and two others are Jews over the age of 40. I witnessed a 73-year-old person who was circumcised here several years ago. It's an internal thing which touches everyone. It's the Jewish soul." The daily quorum maintained by the rabbi will definitely satisfy synagogues in more stable places in terms of their Jewish community: Some 100-150 people arrive every day, "and in the Museums Night which takes place in the summer, when the sun doesn’t set and the museums are open around the clock, people stand in line for a tour and a lesson." 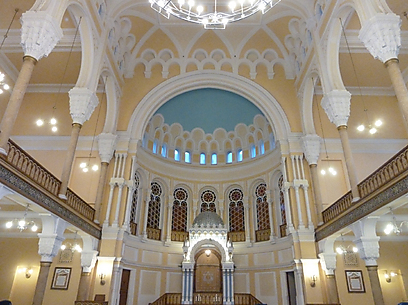 What are Saint Petersburg's residents looking for in the synagogue? Rabbi Pinsky believes it is knowledge and the social dimension, in a city which he says "was always Jewish. "People ask what I expect to see here 15 years from now, and the truth is I don't know. The gift of prophecy was given to fools, but faith was given to every Jew, and I believe that just like we have a lot of emptiness caused by the assimilation here – we are also drawing much closer. I believe that the thirst here points to a good, positive future." 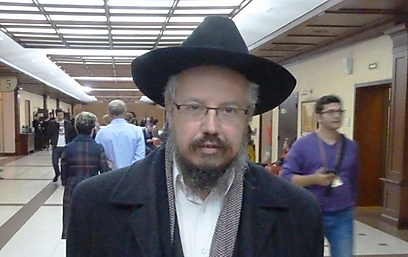 Chaim Chesler, the man and the vision (and the living spirit behind this huge enterprise) commands very different Limmud FSU conferences – due to the different populations they draw – in nine countries. He is already a veteran amateur anthropologist of Jewish populations, specializing in the Eastern European Jewry, and he enjoys pointing out the differences between the various communities living today in the Russian-speaking region. In Saint Petersburg, for example, participants are willing to invest a large sum compared to other areas, which amounts to $200 per participant. "There is a big difference between Moscow and Saint Petersburg," Chesler notes. "Here they see themselves as more intellectual, and therefore lectures are more important to them than workshops." "Saint Petersburg's Jewish community is thorough, interested, knowledgeable, modest, restrained, quiet and introvert," says Limmud FSU COO Roman Kogan. "Code name: North. It's a Limmud which is mostly cultural, and perhaps the least Judeo-centric. One could have expected that the content would be Jewish or Israeli-focused, but that's not the case. The people here are cosmopolitan, and as the program is adjusted, there were lectures not only about Judaism, but also about fashion, business and politics. The community itself is not Judeo-centric, and people here live in an era of multiple identities. "Nonetheless, even the non-Jewish issues which are raised receive a Jewish context, and even if participants prefer to enter one lecture which does not have a classic Jewish nature but two other 'Jewish' lectures – then we did something." Some 350 people arrived at the Jewish festival, as well as 65 lecturers – who also paid, as part of the Limmud idea. "Everyone has a potential of immigrating to Israel," says Chesler, "but we're not a body which encourages aliyah, and not an official information body – and yet we are everything, without forcing messages. It's all done pleasantly for Jews who have a good life here. They have families in Israel, and they have all visited Israel. There are those who made aliyah, there are those who will make aliyah, and there are those who will stay. That's one of our jobs: To preserve the connection between Israel and the Jews here; the young generation. "We manage to reach people who no one else can reach. The young people here are drawn to us. We are not looking for Judaism with a candle, but the candle is what people are attracted to – and we offer them Jewish warmth through issues they are interested in as Jews, out of the pluralism to choose any type of Judaism they want: Religious, secular, Conservative or Reform. There is no coercion here." Kogan says that the unique platform was established in a bid to "give young people the opportunity to redesign their own Jewishness and that of their surroundings – their family and friends – themselves," he says. "Not to sit by and wait for someone to do the job, but to get up and do it – with our help. "We have noticed that young people have different active organizations, and adults have organized groups too. Only the middle generation – young people in their 20s and 30s – have nothing. A void. We entered this void. That is how Limmud turned into a must event, not just on the aspect of strengthening Jewish identity, but also on the personal aspect – doing something for yourself. That those Jews living in the Diaspora will be able to build a Jewish life, maintain a connection to the people and language." Paulina Santrowich, 27, an accountant and economist who lives in the city, has been attending Limmud since the first conference three years ago. "I searched for something for my soul, but because I am very rational I can't accept things I don't believe in," she explains." Limmud appeals to me, because I believe that people need to open themselves up, and here there are a lot of options for that." "People come here from different backgrounds and different fields to share their opinions. I come here because it's convenient for me to meet people who are similar to me, to be in the company of people I feel comfortable with. I prefer to be active within the Jewish community. Petersburg has a strong Jewish community. There are different Jews here, but we have similar stories. We are all part of the same 'something,' and a stranger wouldn't understand that." Santrowich mentions many different events which unify this special community, most of them – if not all – initiated by young locals like her: A Jewish beauty queen competition, an award ceremony for the most active person in the community, meetings with IDF soldiers, and more. "Ten years ago, no one here cared about their Jewish identity. Today people feel more comfortable with their Jewishness." As one of the organizers of the first Limmud conference in Saint Petersburg, she is happy to inform us that "there are many new faces, and it's wonderful. People we don't know. There are more of us than we thought." Mordechai German, 28, another local, was raised – like all Jews in secular Saint Petersburg – in a family far from religion and tradition, but several years ago the young lawyer discovered the religious experience, and today he wears a skullcap and observes kashrut. "There are several hundred Jews here who eat kosher, maybe 300," he says. "Thousands of lost Jews live here, and only a small part of the Jews identify with Judaism. In my workplace 10 out of 200 are Jews, and the boss is Jewish. He doesn’t observe anything, is married to a non-Jewish woman and doesn't want anything to do with the community. This is just a typical example. On the other hand, there are two girls from our company here, and out of the 10 – four are 'active Jews.' The community supports any Jews who identifies himself as a Jew and needs help. "We live in special times. People are connecting to their Judaism. During Communism any identification was forbidden, and the awakening now is everywhere across Russia. You can feel that the Jewish community is getting organized and taking shape." Roman Kogan appears less enthusiastic: "Most people here go to synagogue maybe once a year, as part of a cultural-communal-social thing. The community here is highly assimilated. There was an antithesis here of everything that is Jewish, and this spirit was maintained. The aspiration was to flee the shtetl, and people gave up on their Jewishness consciously. The rate of aliyah here is pretty low, because people here have made a rational decision not to immigrate to Israel." Ruben Landsberger, 44, an entrepreneur, fashion blogger and businessman, defines himself as "addicted to Limmud" (even on his Facebook page), and arrives at every available Limmud seminar. After living in Paris (where he was born), in Madrid and in Kiev, he recently immigrated to Israel. What is he looking for in Limmud? He answers sincerely: Both a wife and a connection to the Jewish identity. "The aliyah I made is largely following Limmud," he says. "It helped me understand how Jewish I was, how Jewish I want to be in my daily life, and therefore live in the place I most belong to." Yuri Astrakhan, 37, may not define himself as "addicted," but he has been participating in Limmud for seven years now – both in Europe and in New York – and he doesn’t deny that the search for his "second half" is part of the issue. He was born in Saint Petersburg, but his parents immigrated to Michigan during his childhood. He now lives in New York and works in Wikipedia. "The people here are culturally different," he says, "and it's an interesting difference. We have a lot to share culturally. The people here are more communicative, more sociable. The Russian society in general is very intelligent and unsociable, unlike the Western society. "The Jewish community here is not open about its Jewishness. It's not that people are afraid to admit that they're Jewish, but they just don't feel comfortable. On the one hand, it's indeed a very warm community – but on the other hand, I feel that people are less open about their identity." "The search for identity is endless," Kogan stresses. "It never ends. I don’t think that's the point – but rather the community's maturity for a project like Limmud."